In just 3 minutes thousands of micro bubbles carry the active oxygen all around the denture killing 99.9% of bacteria. 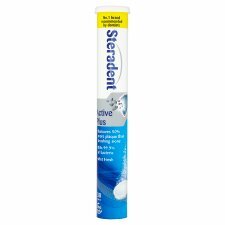 Provides a powerful in depth clean removing 50% more plaque than brushing alone. 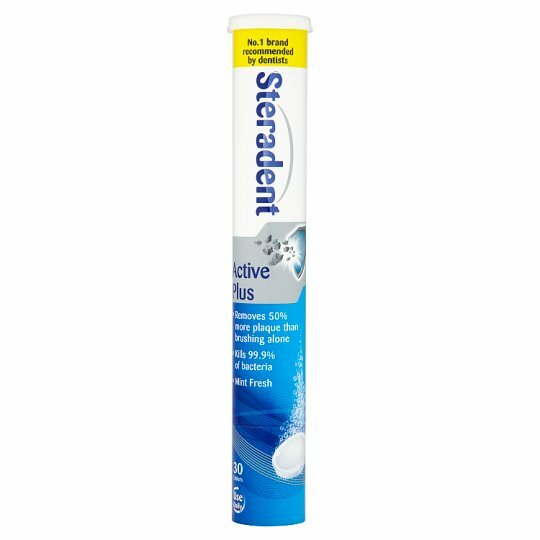 Use twice daily, Steradent Active Plus will leave your dentures feeling perfectly clean. Suitable for full and partial dentures. The formula is safe to use with your dentures and will not cause damage to metal parts. 1. Rinse denture. 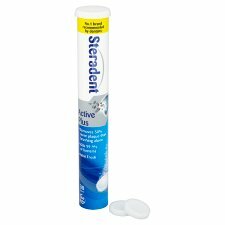 Place one Steradent Active Plus tablet together with your denture in a glass. 2. Fill with warm water to cover dentures and soak for 3 minutes. WARNING ACTIVE PLUS Warning: Keep out of reach of children, and elderly in need of care. For soaking denture only. Do not ingest. Harmful if swallowed. IF SWALLOWED: Call a doctor/physician, if you feel unwell. Have this label to hand. IF IN EYES: rinse cautiously with water for several minutes. Remove contact lenses, if present and easy to do. Continue rinsing. If eye irritation persists: Get medical advice/attention. If medical advice is needed, have product container or label at hand. Causes skin irritation. Wash hands thoroughly after use. Retain tube for future reference.